‘It makes my heart sing!’ After more than five decades of involvement in the art world, this simple statement, made by a friend while looking at a splendid Monet painting, brought into bright clarity the way to know the genuine article–a real work of art. The paintings of Jenness Cortez make my heart sing. For centuries artists have been challenging their intellects and skills by paying homage to the painters who preceded them. Jenness Cortez has emerged as the twenty-first century’s most notable exponent of this facet of art history. Her masterful work gives Cortez solid footing in the colorful lineage of artists who have appropriated vintage images and woven them into their own distinctive, recognizable fabric. Cortez reexamines the classic paradox of realism: the painting both as a “window” into an imagined space and as a physical object. Her work challenges the viewers’ intellectual curiosity and celebrates the sheer pleasure of beautiful painting. In her series of Homage paintings, Cortez plays author, architect, visual journalist, art historian, curator and pundit to help open our eyes to what we might otherwise have overlooked or taken for granted. Each painting presents a specific theme, mixing straightforward cues and obscure allusions, complemented by references to other artists’ lives and times. 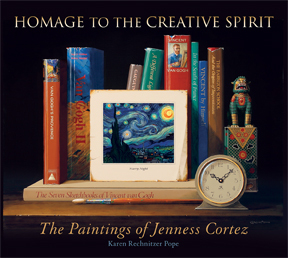 By masterfully presenting iconic works of art in unexpected modern settings, Jenness Cortez inspires us to see differently–to rediscover and revalue our own creative power in everyday life.This volume surveys and celebrates the Homage to the Creative Spirit series in fifty-four examples that display the range and variety of Cortez’ achievement. A key to the impact and success of these paintings is the skill with which she achieves meticulous likenesses of everyday objects. This quality of realism, both sensuous and immaculate, offers exceptional visual pleasures. For collectors and for fortunate gallery goers, these works are marvels to behold. Thanks to modern technology, a selection from Jenness Cortez’ Homage to the Creative Spirit is here available to a wider audience. KAREN POPE, PhD in the History of Art, is a full-time member of the Baylor University Art Department faculty. She teaches courses in nineteenth century European and American art, the priority of Baylor’s Allbritton Art Institute. After studies at Colorado College, followed by an MA from Ohio State University, Karen completed the doctorate at The University of Texas at Austin in 1981. She developed a flair for the informal classroom of day trips, study tours, and lecture programs, and offered a range of art history experiences for the Central Texas community through UT’s Fine Arts Continuing Education. A popular guest speaker and tour director, she has offered her own “adventures in art history” as Art inSight Inc. since 1995. In 2010, Karen was elected to a six-year term as an Alumni Trustee of Colorado College.